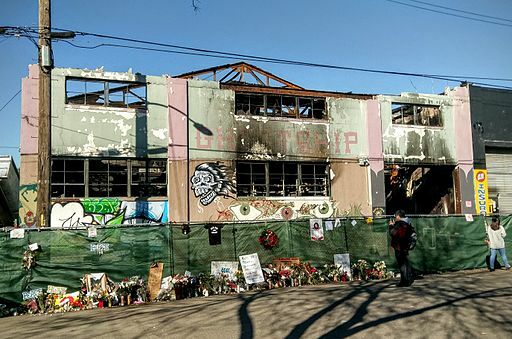 OAKLAND, Calif. (CN) – Two men pleaded no contest Tuesday to involuntary manslaughter charges over the deaths of 36 people who perished in the Ghost Ship warehouse fire in Oakland and accepted county jail sentences of nine and six years. Derick Almena, 48, and Max Harris, 28, entered their pleas in Alameda County Superior Court in downtown Oakland and were pronounced guilty on 36 charges of involuntary manslaughter, avoiding a July 16 jury trial that was slated to last up to six months and which could have put them in prison for the rest of their lives. Harris, dressed in a red and white striped jail suit, cried as Judge Morris Jacobson read the names of the victims, some of whom were close friends, according to Harris’ lawyer. His voice and Almena’s were barely audible as they entered their pleas for each of the 36 counts, one for each person who died while attending a dance party at the Fruitvale-area warehouse when it burned down on Dec. 2, 2016. Both men were found to have negligently run the Ghost Ship, leading to the fire. According to prosecutors, Almena, the building’s master tenant, and Harris, its creative director, illegally rented the warehouse to concert promoters and as many as 25 residents, even though it was only zoned for industrial use; failed to ensure it complied with fire and safety codes; installed a rickety, handmade staircase; and crammed it with flammable materials. A civil lawsuit also claims the Ghost Ship got its power from an adjacent building via a cable snaked through a hole in the wall. Almena and Harris both accepted split sentences of 12 and 10 years, respectively. Almena will serve three of those years under supervised release, which is similar to probation. Harris will serve four years under supervised release. However, with time served and the legal requirement that California inmates serve just half of their sentences, Almena will serve about 3.5 years in custody and Harris 23 months, according to their lawyers. “It’s not what I would call devastating,” Almena’s attorney, Tony Serra, told reporters. But the victims’ family members, some of whom were at the hearing, said the sentences weren’t long enough. Gregory is one of a slew of loved ones suing Almena and Harris on civil charges, along with the city of Oakland. The plaintiffs in the civil case also blame Oakland for the fire, claiming it neglected to inspect and shut down the Ghost Ship for not being up to code, though police and fire personnel visited repeatedly before the fire and knew it was unsafe, and the city planning and building department had received multiple reports of dangerous conditions there. In May, it emerged that the scene of the fire was never tested for arson, and an investigator destroyed evidence by removing and destroying debris left behind by the fire. Almena’s and Harris’ lawyers had argued that the evidence could have exonerated their clients. Briggs said reaching a plea agreement had been difficult, in part because Harris’ defense team pushed back on the idea that he should serve jail time for his role in the fire. Harris, who also collected rent from tenants, was accused of blocking off one of only two stairwells in preparation for the night’s festivities. Most of the victims died of smoke inhalation, trapped on the second floor. Mary Alexander, who represents 11 of the victim’s families in the civil case, said having Almena and Harris pronounced guilty by the judge had given the families a “small sense” of justice. Sentencing is scheduled for Aug. 9 and 10. The civil trial is scheduled to begin Oct. 7, 2019.